How can you tap into your team’s creativity to tackle today’s toughest business challenges? KIMBERLY DOUGLAS, SPHR, is a nationally recognized expert in building the effectiveness of teams, based on her knowledge of industrial/organizational psychology combined with her real-life consulting and corporate human resources execu-tive experience. As President of FireFly Facilitation, she has collaborated with hundreds of leadersat organizations such as AT&T, Cisco, United Way, and even the U.S. Marine Corpsto dramatically improve their business performance. She is frequently featured in national publications and is a sought-after speaker at meetings and conferences. 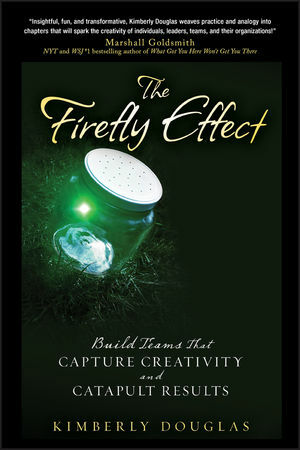 To learn more about the author and how to improve your team's performance, visit TheFireFlyEffect.com. PART I: REDISCOVER YOUR CREATIVE SPARK. Chapter 1: What is The Firefly Effect? Chapter 2: The Individual – Creativity Found Again. PART II: THE LEADER’S ROLE – CREATING THE RIGHT ENVIRONMENT. Chapter 3: The New Role of Leadership. Chapter 4: No Dissing the Red Quadrant. Chapter 5: Beware the Ferocious Firefly! Chapter 6: Conflict as Creative Abrasion…a pearl, a diamond, or a mountain? Chapter 7: Was It Something I Said? PART III: THE LEADER'S ROLE – TARGETING TEAM ENERGY. Chapter 8: One Team – One Picture of Success. Chapter 9: How Will You Know When You Get There? Chapter 10: Guiding Principles as Guiding Light. PART IV: EVERYONE FIRING ON ALL CYLINDERS. Chapter 11: Team Gatherings – Time to Shine. Chapter 12: Team Decisions – Fact or Fiction. Chapter 13: What to Do if the Leader Is Keeping Too Tight a Lid on the Jar. Chapter 14: Shining the Light of Accountability. Chapter 15: The Firefly Chase Begins. Chapter 16: How Could You Forget the Toys? Chapter 17: This Place Is a Zoo! Chapter 18: When Sparks Collide – Dealing with Inter-Team Conflict. PART VI: SYNC – THE MAGIC. Chapter 19: There's Something Going on in My Backyard! Chapter 20: Change Is Not a Four-Letter Word. Chapter 21: At the End of the Day.